Vietnam Airlines has become the latest Southeast Asian airline to commit to new ultra-long range aircraft enabling the launch of nonstop flights to the continental US. Vietnam Airlines has acquired 10 higher gross weight A350-900s, which are capable of operating nonstop Los Angeles to Ho Chi Minh even in strong headwinds, from 2020. Vietnam Airlines has been preparing for flights to the US for several years and now finally has committed to acquiring an aircraft capable of launching its preferred US route. Several US routes are possible but Ho Chi Minh-Los Angeles is by far biggest Vietnam-US city pair with over 100,000 annual one-way passengers. Vietnam Airlines will join Philippine Airlines, Singapore Airlines and United Airlines – and likely Garuda Indonesia and Thai Airways – in operating nonstop flights from Southeast Asia to the continental US. New generation aircraft have opened up new opportunities to operate Southeast Asia-US fights economically but overcoming intense one-stop competition will be a challenge. This is Part 1 in a two part series of analysis reports on ultra long-range flights between the Southeast Asia and the continental US. This part will focus on the Vietnam-US market and Vietnam Airlines’ plans for launching flights to the US in 2020 starting with Ho Chi Minh-Los Angeles. Part 2 will examine other planned and potential new nonstop flights from Southeast Asia to the US, taking advantage of new generation ultra long-range aircraft. Vietnam Airlines on 6-Sep-2016 signed a Memorandum of Understanding (MOU) with Airbus for 10 280-tonne max take-off weight (MTOW) A350-900s for delivery from 2020. The new deal supplements earlier commitments for 24 A350-900s with the original 268 tonne MTOW. Four of these aircraft have already been delivered and are used on European routes. Airbus announced in Mar-2016 the availability of the new higher gross weight 280-tonne A350-900 from 2020, essentially boosting the aircraft’s range by approximately 1000km. The new 280-tonne variant opens up several potential ultra long-range routes which were not feasible with the existing 268-tonne and 275-tonne versions – at least not economically feasible when factoring in payload limitations. Ho Chi Minh-Los Angeles is one such route. Vietnam Airlines has repeatedly expressed a desire to serve the US. It initially planned to launch Ho Chi Minh-Los Angeles in 2007 and has since repeatedly pushed back the launch of flights to the US. Vietnam Airlines initially looked at ordering the 777-200LR for Ho Chi Minh-Los Angeles but never acquired the current generation ultra long-range type. The airline subsequently aimed to operate Ho Chi Minh-Los Angeles with the 787-9s or A350-900s, both of which it started receiving in 2015. However, as CAPA pointed out in a Sep-2015 analysis report, Vietnam Airlines determined after placing both aircraft types into service that neither were capable of operating Ho Chi Minh-Los Angeles without payload restrictions. “Vietnam Airlines has begun evaluating new aircraft types which would enable it to economically operate routes to North America. The evaluation of ultra long-range aircraft are part of a broader plan to increase new generation widebody commitments,” CAPA wrote in the Sep-2015 report. See related report: Vietnam Airlines begins new chapter with A350s, 787s. Are 777-8Xs and a strategic investor next? The MOU for 10 additional A350s lifts Vietnam Airlines’ commitments for new generation widebody aircraft to 42 aircraft, 11 of which have now been delivered. Vietnam Airlines plans to nearly double its widebody fleet over the next five years from the current fleet of 23 aircraft. Vietnam Airlines plans to phase out its A330-200 and 777-200ER fleets – it currently has 12 of these older generation aircraft – by the end of 2018. In announcing the acquisition of the 10 additional A350-900s Vietnam Airlines stated it would use the aircraft to expand in Europe and launch flights to the US. The aircraft will be delivered from 2020 in the same 305-seat configuration used on the existing A350 fleet. Vietnam Airlines could potentially have accelerated the launch of US flights by opting for the A350-900ULR, which is available from 2018. However the 280 tonne non ULR variant is a more sensible option given that Vietnam Airlines will need a relatively dense configuration to be profitable in the US market. The A350-900ULR has the same 280 tonne MTOW with modified fuel tanks that limit the capacity. Vietnam Airlines could have also potentially pursued US flights with its current A350 fleet by compromising on seating density or selecting a shorter route – such as Hanoi-Los Angeles. However these would not have been smart compromises given that the the Vietnam-US market is overwhelmingly from Ho Chi Minh and consists predominately of leisure traffic. Singapore-US is a much stronger business market, giving Singapore Airlines (SIA) the flexibility to operate US nonstop flights with a lower density configuration. SIA has 52 - or 17% fewer - seats on its A350-900s than does Vietnam Airlines. SIA’s A350-900ULRs will have even fewer seats – likely only slightly more than half the seats of the Vietnam Airlines current and future A350s. SIA plans to operate A350-900ULRs on Singapore-Los Angeles and Singapore-New York from 2018 while deploying A350-900s on Singapore-San Francisco from Oct-2018. Waiting until 2020 gives Vietnam Airlines the ability to maintain its preferred 305-seat configuration for Ho Chi Minh-Los Angeles and avoid any payload limitations. Waiting four years also gives Vietnam Airlines more time to build up its brand in the US market and Vietnamese authorities more time to secure a US FAA Category 1 rating. Vietnam currently does not have an FAA rating as it has never been audited under the FAA’s international aviation safety assessment (IASA) programme. Any foreign airline seeking to launch services to the US or expand in the US needs to be based in a country with a Category 1 rating. Once Vietnamese authorities can secure a Category 1 rating from the FAA Vietnam Airlines can begin the process of applying for individual FAA approval, which can also be a long and tedious process. Strategically the US is a critical market for Vietnam Airlines – and for its government shareholder. The US is an important component of the airline’s long term business plan. Vietnam-US is one of the world’s largest unserved nonstop markets, with over 1 million passenger per year. The market had more than doubled in size since Vietnam Airlines first aimed to launch services to the US and continues to grow rapidly. There were over 600,000 bookings from Vietnam to the US in the year ending 30-Jun-2016 (FY2016), according to OAG Route Analyser data. Bookings increased 16% year over year and were up nearly 50% compared to the year ending Jun-2013 (FY2013). Vietnam recorded nearly 500,000 US resident visitor arrivals in 2015, making the US its fourth largest source market. A large portion of these visitors are from the large diaspora, Vietnamese Americans returning to Vietnam for family visits and holidays. There are approximately 1.7 million Vietnamese residing in the US. The US is Vietnam’s only top 10 source market not currently served nonstop. Vietnam Airlines’ 2014 IPO prospectus identified three potential US routes – Ho Chi Minh to Los Angeles, San Francisco and Washington Dulles – as well as Ho Chi Minh to Vancouver in Canada. The prospectus identified Los Angeles as the first US route with a targeting launch date of 2016 – which has since been delayed to 2020. Los Angeles has always been the top priority as Southern California has the largest Vietnamese community in the US. Los Angeles International Airport (LAX) is also now the largest US destination from Vietnam. LAX accounted for approximately 22% of total Vietnam-US bookings in the year ending Jun-2016. San Francisco is the second largest US destination for Vietnam-US traffic, followed by Houston, New York and Washington DC. All of four of these cities have large Vietnamese populations when including the suburban areas. Vietnam Airlines has hubs in both Ho Chi Minh and Hanoi. Ho Chi Minh is only slightly larger with approximately 84,000 international seats per week compared to approximately 80,000 for Hanoi (based on schedules for the week commencing 5-Sep-2016). All four of Vietnam Airlines’ European destinations (Frankfurt, London, Moscow and Paris) are now served from both Hanoi and Ho Chi Minh. However, as highlighted earlier in this report, Ho Chi Minh is by far the largest gateway in Vietnam for Vietnam-US traffic, making potential routes from Hanoi to the US more challenging economically – although operationally easier due to shorter flight times. Hanoi accounted for only 11% of total Vietnam-US bookings in the year ending Jun-2016 compared to 85% for Ho Chi Minh. While there is sufficient traffic to support several nonstop flights, operating any Vietnam-US route profitably will not be easy. Vietnam Airlines will have to overcome stiff competition from several North Asian airlines, most of which have pursued rapid expansion in the US in recent years with an increasing reliance on sixth freedom traffic to Vietnam. Taiwan’s EVA Air has particularly been aggressive in the Vietnam-US market as it has doubled capacity to the US over the last three years. EVA now serves five destinations in the US – including most of the major Vietnamese communities. EVA has up to three daily flights to Ho Chi Minh, providing convenient connections to all its US destinations, and one daily flight to Hanoi. EVA captured approximately a 22% share of the Vietnam-US market in the year ending Jun-2016. EVA now carries an average of nearly 400 passengers per day from Vietnam to the US – a remarkable figure given that EVA has less than 1,000 daily seats from Vietnam. EVA has an average of approximately 2,700 daily seats to the US and relies heavily on connections to Southeast Asia – particularly Vietnam – to support its growing US operation. Cathay Pacific and Korean Air are also strong players in the Vietnam-US market with 17% and 11% shares respectively in the year ending Jun-2016. Taiwanese flag carrier China Airlines is the fourth largest airline in the Taiwan-Vietnam market with a 11% share. Korean is the largest Asian airline in the US market while Cathay is fourth largest, behind Japan Airlines and All Nippon Airways (ANA). EVA is now the sixth largest, just behind China Airlines. Most of these airlines along with some of the US carriers have pursued rapid capacity expansion on the North Pacific in recent years, leading to overcapacity and pressuring yields on virtually every East Asia-US market including Vietnam-US. US carriers accounted for approximately 18% of bookings in the Vietnam-US market in the year ending Jun-2016. This includes an 8% share for United Airlines, 7% share for American Airlines and 3% for Delta Air Lines. United has been unable to secure a significant share despite being the only US carrier with services to Vietnam. United launched services to Ho Chi Minh in 2004, shortly after US-Vietnam relations normalised. It initially served Ho Chi Minh with a daily 747-400 flight from Hong Kong but down-gauged Hong Kong-Ho Chi Minh to a 737-800 in 2011. United recently announced it is suspending services to Ho Chi Minh entirely from the end of Oct-2016, again leaving the Vietnamese market without any service from a US carrier. United’s 2004 launch ended a nearly 30 year hiatus without any service from a US airline. 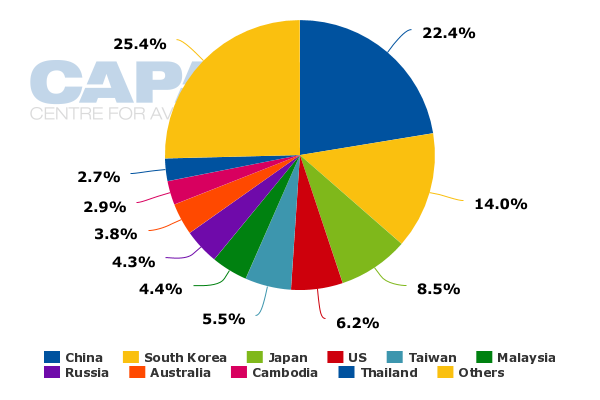 The fact United currently only has a slightly higher share of the market than American, which serves Vietnam mainly with connections via Tokyo operated by joint venture partner Japan Airlines, suggests United should be able to maintain most of its share without an online product. United’s retreat also highlights how challenging it is to compete against North Asian airlines in the Vietnam-US market, particularly as it is primarily a price sensitive leisure market. United will likely rely more on connections via Tokyo with joint venture partner All Nippon Airways (ANA) after it drops Ho Chi Minh. Vietnam and other Southeast Asian markets are included under the United-ANA trans-Pacific joint venture. ANA currently accounts for an approximately 5% share of passengers in the Vietnam-US market. ANA forged a strategic partnership with Vietnam Airlines in early 2016 and now owns a 9% stake in the Vietnamese flag carrier. Vietnam Airlines has traditionally worked with fellow SkyTeam member Delta Air Lines. However, Delta has been unable to place its code on Vietnam Airlines operated flights and has had to rely on interline connections because Vietnam is not in Category 1 (an FAA requirement for US carrier codeshares on flights operated by foreign carriers). The Delta-Vietnam Airlines codeshare is therefore now limited to Delta-operated flights. Delta accounted for less than 3% of Vietnam-US bookings in the year ending Jun-2016, giving it a significantly weaker position than American or United. Vietnam Airlines currently has virtually no Vietnam-US bookings. If Vietnam secures Category 1 within the next couple of years Vietnam Airlines should be able to build up a bigger offline business in the US prior to its 2020 launch of its own US services. Vietnam Airlines will need all the assistance it can get from ANA as it prepares for US operations in 2020. Ultra long-haul flights are complex operationally and competing in the trans-Pacific market can be extremely challenging. The direct Vietnam-US is too big a market for Vietnam Airlines to ignore. Strategically Vietnam Airlines needs to be in the US sooner rather than later. New generation aircraft technology will make its longstanding ambition of operating US nonstop a reality. However a profitable US operation will be difficult to achieve. Yields in the Vietnam-US market are already low and not likely to recover. Ultra long haul flights are costly and come with significant risk – even with new generation aircraft technology. One stop competitors will generally have an advantage, with routing and pricing variety; and, until Vietnam's GDP and trade links improve significantly, Vietnam-US is not likely to become a market where a nonstop option commands a significant premium.